Enlace has been discontinued in favor of other culture learning programs at the Portland Mercado! Please contact us at info@pptpdx.com or 503 522 1589 if you are interested in developing your Spanish skills! Enlace, which means “connection”, is a place to meet up for guided Spanish practice, one of the only spaces for individualized Spanish practice in the Portland Metro area. It’s facilitated by Spanish speakers called Guías Culturales (culture guides) who offer their time at no cost as a way to promote their own tutoring services. You start by coming any Tuesday night any time between 6:00pm and 8:00pm. If there’s a Guía available, we’ll match you. After 30 minutes, you’ll switch partners. We’ll check in with you afterward so that you can let us know if you’d like to hire your Guía and, if you do, we’ll help you get that set up! The Guías have different levels of expertise – some are new, some are experienced; some speak English and others don’t. We are here to help you get real-world practice while supporting them becoming better tutors! But is Enlace right for you? Yes! If your Spanish level is lower, let the Guía do most of the talking – because you don’t have the words yet. Write down everything they say, and repeat it. If they’re talking too quickly, stop them. This will help your pronunciation, listening, and writing. 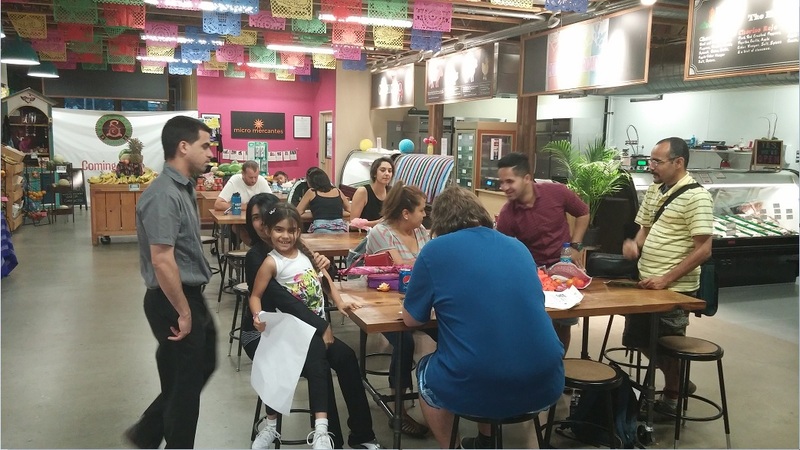 Please join us for Enlace every Tuesday from 6:00pm to 8:00pm at the Portland Mercado located at 7238 SE Foster Road. For more information, please email us at info@pptpdx.com or call us at 503-522-1589.